In order to get a good score on the TOEFL listening section, you must take good notes as you listen actively throughout the entire listening. Many students struggle with this. They take either no notes so they have trouble remembering important information or they take too many notes and sacrifice understanding and comprehension. Many students also think they can do better without taking notes because they feel it distracts them. Without practice and knowing what notes you should write down, it could be faster to simply not take notes. However, once mastered, note taking will significantly help you answer questions quickly and most importantly, accurately. In this article, we will go over 11 note-taking tips for TOEFL listening conversations and lectures. 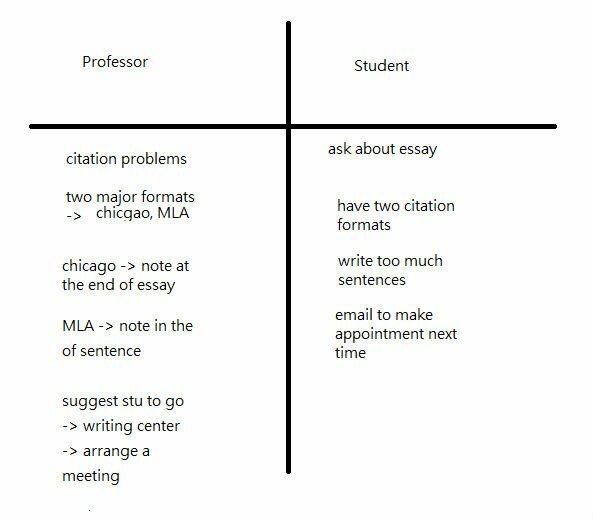 Taking notes on conversations is easier in comparison to lectures. First, conversations are usually much shorter. Second, conversations take place on a college campus and deal with situations related to university life, so you are most likely familiar with these subject matters. If you're not, that's OK! You will still find it easier than lectures. Third, if you miss what one speaker says, the other speaker will probably give you a clue as to what you missed. Here are some tips for taking notes for conversations. When you take notes on conversations, you should be aware that conversations contain more implied information compared to lectures. Implied information means information that is suggested but not directly stated. Let's look at an example of implied information. Listen to the following conversation and pay attention to the student's tone of voice. Try to interpret what the student's tone of voice implies when he responds to the professor’s compliment. What implied information did you get from the student's tone of voice, after the professor gave him a compliment? The answer is "C. surprised". His tone was quick, then slowed down as he processed the information he was not accustomed to. 2. Find a balance between listening and note-taking. The rule of thumb is that you should take just enough notes to help you remember important facts/information, so that you can focus most of your attention on understanding the conversation. If you're having a difficult time listening to the conversation because you are taking notes, then you probably need to take fewer notes. You don't need to write down everything; Sometimes even one word can ignite your memory and help you remember an answer, but only practice will allow you to accomplish this. If you're having a difficult time remembering the conversation then you need to look at your note-taking strategy and change it to something that works better for you. Ideally, you'll pay attention perfectly for the duration of the test and understand all of the main ideas the first time they’re mentioned. But practically speaking, your mind may wander or at some points, you may not understand what the professor is talking about. When this happens, just let it go and start listening again. Why should you let it go and start listening again? Because, if you try to figure out or stress about what you missed, you will end up missing even more or you will become completely lost. It's better to potentially miss one point rather than missing several. Another issue is if you end up missing several, you may become extremely stressed out, which can carry over to other sections of speaking and writing. People with a high level of English skills have been known to do poorly due to stress. We don't want to scare you, but it can happen if you are not prepared. Our program will help prepare you so you feel confident on test day. Once practiced and understood, symbols can save you a lot of time with your note-taking. Symbols are used instead of certain words. For example "Cause and Effect" can be shown with arrows. “Decrease,” “fall,” “short,” “cheap,” and “worse” can all be shown with a down arrow, while "Increase", "rise", and "surge" can all be shown with an up arrow. While practicing note taking, remember to replace words with symbols. Everyone is different, so replace the words with symbols that make the most sense to you. The two-column layout is one of the best layouts for taking notes for a conversation between two people because it helps to organize the speakers without the need to write down the speaker each time you make a note. Example, the left column is used for speaker 1, while the right column is used for speaker 2. When you’re listening to a lecture, you need to listen differently than you do for a conversation. Lectures tend to be much longer, have more information to remember, and often deals with several topics or key points. Conversations, on the other hand, are generally shorter and deal with one or two topics. During the lecture, you will listen to the professor discussing a new concept or a new definition. If you get confused when you first hear it, just relax because the professor will probably give some examples to clarify his or her point. So what you should do is quickly write down the new concept you heard, even though you may or may not understand it or know how to spell it. Next, pay close attention because the professor will eventually clarify and explain the new concept and you will want to write it down, as well. Let's have a look at an example to help you understand this point further. During the lecture, please practice your noting taking by writing down the new concept presented and any important information about it. So how did you do? Take a look at the answer and see if you wrote down the correct information. So the new concept in this lecture is algae biodiesel. When you first hear it, you might not know what algae biodiesel is, but as the professor continues to explain, you should begin to understand that algae biodiesel is a form of fuel and is made from algae. Sometimes you'll need to answer questions on the overall structure of the lecture. Questions related to the overall structure are called "Organization Questions". While taking notes, it is important to preserve the original structure of the lecture in your notes, so that you don’t get stuck when an organization question comes up. Your notes should not include every detail that is spoken. You only have to write the big ideas that help you remember the small ones. If you try to write everything, you will have trouble keeping pace and you will eventually miss important information. In addition, you need to write down key relationships between ideas like examples, comparisons, contrasts, and cause and effect. Pay special attention to transition words because they express relationships between ideas. Let's listen to the following lecture and practice taking notes on capturing the relationship between the presence of pollen grains and higher temperature in Antarctica during Middle Miocene age. The professor says, "Pollen grains are small particles that plants release when they reproduce. Grains from two types of trees dating to 15 million years ago have been found on the coast of Antarctica. So what does this tell us? You see, trees typically require much higher temperatures than the plants that currently grow in Antarctica. So the presence of trees indicates that the plant life in Antarctica was much richer during the Middle Miocene, and that the temperature in Antarctica was apparently much higher than it is today." Because the current temperature of Antarctica is too cold for trees to live there, this is evidence that the temperature was higher in the past. 4. Find a balance between listening and note-taking. Because, if you try to figure out or stress about what you missed, you will end up missing even more or you will become completely lost. It's better to potentially miss one point rather than missing several. Another issue is if you end up missing several, you may become extremely stressed out, which can carry over to other sections like speaking and writing. People with a high level of English skills have been known to do poorly due to stress. We don't want to scare you, but it can happen if you are not prepared. Our program will help prepare you so you feel confident on test day. Your test center will give you scratch (blank) paper to use during the test. If you run out of paper at any time, you may ask a staff member to give you more. At the end of the test, your notes will be collected and destroyed for security purposes.